Taken by Japanese photographer Shimpei Asai, these pictures, never before published outside Japan, intimately capture a fleeting moment, with all its controversy, Beatlemania and creativity, painting a poignant image of the band during their short but intense visit. Shimpei Asai is the only Japanese photographer to have gained access to The Beatles in Tokyo, and his photos have remained unknown to most outside Japan. They offer an intimate portrait of The Beatles in their first trip to the country, capturing their time on and off stage: performing, painting and experimenting with traditional Japanese instruments. Following The Beatles from their arrival at Haneda Aiport to their departure for the Philippines, Asai captured everything from their hotel rooms to their live performances, all with a spontaneity which offers a glance into the lives of the Fab Four towards the end of their touring years. Asai describes his experience of photographing The Beatles, recounts John Lennon and Paul McCartney's attempts to escape from their hotel to see the city, and revisits the atmosphere of their live performances. The manuscript is introduced with an essay by journalist and author Allan Kozinn, who considers the historical significance of The Beatles visit and the turning point they were about to reach with the release of Revolver. Asai has won awards from the Tokyo Art Directors Club and the Tokyo Copywriter's Club. His work is regularly featured by Canon, and he has created award-winning movie posters, for films such as Parco. In 1991, Asai opened a gallery for his work, the Seaside Museum in Chiba, and continues to work on various artistic projects, most recently combining his photos with Haiku poetry. As well as photography, Asai has also branched out into filmmaking, (writing, directing and filming Kidnapping Blues in 1982) and has made numerous Japanese TV appearances. Quarter-bound in leather each copy in this hand-crafted edition is signed by photographer Shimpei Asai. Collector copies are numbered 351 to 1,966, to commemorate the year of The Beatles' visit to Tokyo. The cover is black buckram, silk-screen printed and gold-foiled with Asai's iconic photo of The Beatles' onstage at the Budokan. 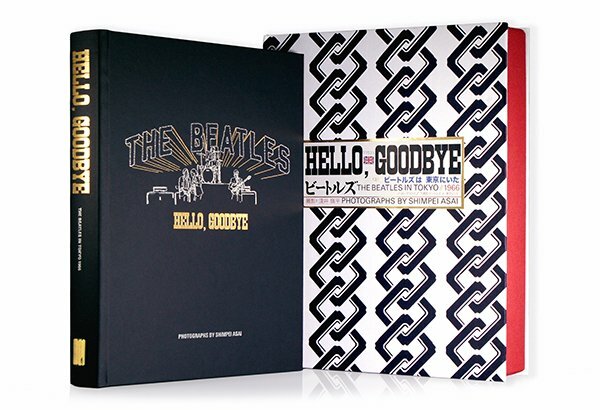 Each copy comes in a slipcase printed with a traditional Japanese kimono pattern, and a logo type design inspired by the tickets from The Beatles 1966 shows. A ribbon bookmark with a facsimile ticket is included. Printed on art papers, at 25cm x 30cm (9.8 inches x 11.8 inches), The Beatles visit to Japan is revisited in over 204 pages of words and photographs. Each copy comes in a slipcase printed with a traditional Japanese kimono pattern, and a logo type design inspired by the tickets from The Beatles 1966 shows. More than 50 years after their 1966 Budokan concerts, a limited edition of rare photographs documenting the Beatles' visit to Tokyo. Taken by photographer Shimpei Asai, these pictures have never before been published outside of Japan. They offer an intimate portrait of The Beatles on and off stage during their final tour.